It would not be right to talk about the London Olympic canoe slalom without paying tribute to Martyn Hedges. I am sure there are many canoe slalom paddlers who have never heard of Martyn Hedges but may very well have paddled in a Bushsport deck, never making the connection between the brand name and the legacy of the GB World Championship bronze medallist. Barcelona was the first re-appearance of Canoe Slalom as an Olympic event since the singe inclusion in Munich on the Augsburg course in 1972. Competition in C1 within the UK was tough, particularly between Martyn, Gareth Marriott, Mark Delaney and Bill Horsman. Olympic selection in the snow in Seu in April 1992 was nail biting! 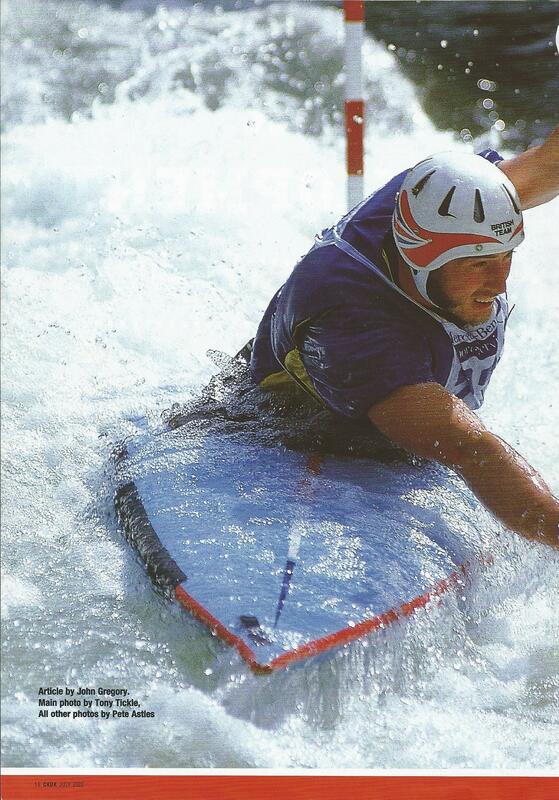 Gareth had won the pre-Olympics at Seu in 1991 and went on to win Great Britain’s first Olympic medal in Canoe Slalom with a silver medal in 1992. Interestingly, Mark is now coach to David Florence & Richard Hounslow! Back in the 1992 Olympic days nations could select three boats per class, not just one. The British team decided not to fill his place for the Barcelona Games. Gareth Marriott said; “The decision not to replace Bushy in the Olympic Team was THE most powerful tribute available. He was the sort of guy you couldn’t replace. Bill [Horsman], his potential replacement, didn’t want a place that belonged to Bushy, he wanted his own place in the team.” The gold medallists from Barcelona were Italian, Pierepaolo Ferrazzi, (now coach to Daniele Molmenti), Germany’s K1W, Lisa Micheler-Jones, Czech, Lukas Pollert in C1 and in USA’s Strausbaugh & Jacobi in C2. There have been other trail blazers within canoe slalom. The names of Great Britain’s K1M Richard Fox, USA’s C1 Jon Lugbill & Davey Hearn immediately spring to mind. It would be reasonable to cite Michal Martikan and Pavol & Peter Hochschoners as the current trail blazers from Slovakia which has developed as one of the best nations in canoe slalom. World Championships have been held every two years since 1949, apart from in an Olympic year and with the exception in Maryland, USA due to 9-11. Paul Farrant won Great Britain’s first canoe slalom gold medal in K1M in 1959. Folding kayaks were used from 1949 to 1964, think of that on the Lee Valley course. Anyone care to try? The LOCOG Canoe Manager of London2012, John MacLeod was a member of the 1972 Great Britain Olympic squad in Augsburg. The sport has evolved. Once upon a time there were green and red gates, 5 second penalties for a gate touch continued up until the Athens Olympics in 2004, when the penalty changed to 2 seconds, partly to reflect the much shorter TV influenced run times. The course length has shortened from 3 minutes back in the 1980’s, to 2 minutes in Barcelona to around 95 seconds in 2012. In a move to greater equality, Women’s C1 was debuted in 2009 and became a medal event in 2010 at the Tacen, Worlds. Yesterday, I referred to the Team event. Although this is not an Olympic event, it is a common feature of national and World Championships. Three paddlers in the same class make a team (club or nation) and paddle together down the course. The clock starts when the first competitor starts and stops when the third competitor crosses the finish line. Penalties are accumulated from the three paddlers. It is an amazing spectacle to watch, especially in C2, requiring excellent team work and timing to keep tight enough together without hindering each others passage. It’s also fun! Tomorrow’s post will start examining the four classes, giving insight into the equipment, techniques and paddlers. Great site, thank you, and a wonderful tribute to Marty Hedges. He has been in my thoughts these past few days while watching inspiring Olympic performances at the White Water Course. In the mid-80s I was one of the those young paddlers you speak about who were inspired by Bushy. I still think he had one of the most elegant and efficient paddling styles I have ever seen – I can picture his Augsburg ’85 run even now. One of the highlights of my paddling career was when he introduced himself at a club championship when I was about 14 and just beginning to compete in C1. He invited me to go for a paddle between runs to offer some pointers. It was amazing to then as a 14-year old, and now (considerably older) that he would make such an effort at the expense of his own preparations. I’m sure there are others who could tell similar stories. Despite his success, he always had the time to help those starting out. It would be unfair not to point out that some of Martyn’s contemporaries were just as generous with their time, Pete Bell and Jim Sibley (not quite a contemporary) were great supporters of young paddlers too. Perhaps that is the tradition that paid back team GB with gold and silver medals yesterday. It really is too bad that Slalom wasn’t in the Olympics in the 80s – what a difference it would have made to the profile of the sport to have likely seen multiple GB medals in LA and Seoul: Richard Fox, Liz Sharman, Bushy, to name just a few. And the consistency of Jon Lugbill and David Hearn certainly deserved Olympic recognition. Thanks again for this great site, for connecting those amazing scenes yesterday with the canoeing stars of the past. Thanks for the tribute to Martyn Hedges. I am an American c-1 paddler who used to compete against him. He was an excellent racer- he was the european we most feared racing against. And he was well-liked among the racers- the kind of person you would cheer for. We all felt great sadness upon hearing of his death in 1992 because we were expecting to see him compete at the Olympics. He was no longer favored at the time, but he had never had the chance to compete at the Olympics. It is very moving that they never filled his spot at the 1992 Olympics in honor of Martyn.